Top Right Group is a worldwide media business with data transfer needs spanning several continents. Speed, price and freedom of data exchange are top priorities for the business, which is why it relies on Maytech for a tailored solution. Top Right Group is a major player in business-to-business (b2b) magazines, digital media and events. With a global presence, its data needs are as big as they are complex. It grew out of publishing conglomerate Emap plc, a media business with radio stations, consumer magazines and business-to-business products. The old firm used BT (formerly British Telecom) and Maytech for its data transfer needs, but as part of the transformation to Top Right Group in 2008, Maytech became their exclusive provider of secure data transfer solutions. "A real draw for Top Right Group was Maytech’s ability to move millions of files between geographical locations quickly and securely." As a global media company, it's constantly firing large image and video files between countries. A case-in-point is Top Right Group’s WGSN business, a fashion forecaster helping designers and retailers predict demand in future seasons. It scans the world’s catwalks and looks at emerging designs, materials and cuts that will soon be worn by fashion-conscious consumers. WSGN employs a diverse army of freelance fashion photographers who are paid to snap the latest catwalk designs and beam images back to London for processing and dissemination to the business’ many clients. Latency in moving this information around the globe is a tremendous issue for Top Right Group. "Achieving goals and satisfying client needs on time is in the fabric of the business and failure to do so could destroy its competitive advantage." 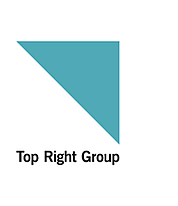 It means Top Right Group has an unending need for secure, fast and flexible data services. The business is big, yet still growing, with acquisitions swelling the company’s user base. More people means more demand on data, and the technical team is glad of Maytech’s easy-to-scale formats. “Last year, we bought a business in the US which had an additional 500 users, so now we have around 2,000 users across the organisation,” says Iain Caldwell, the firm’s head of technical delivery. The company utilises Maytech’s global infrastructure, with hubs in 4 locations. One of the primary advantages of this is that employees can log in from anywhere in the world and upload to a server local to them. "Maytech’s mirroring technology accelerates the data transfers around the world to accommodate their follow the sun workflows. Importantly, it also gives them a huge first-mover advantage and a secure solution they can trust"
With thriving business areas ranging from magazines to festivals, Top Right Group has heavy demands on its data in both size and quantity. It all equates to a high data use: approximately a terabit-worth of uploads and downloads a month. "...driven by our need for a truly international solution." The Maytech service enables Top Right Group to make acquisitions and move into new territories without worrying about data residency or portability issues, meaning it can concentrate on the core drivers of the business. “The Maytech solution helps many of our business be first to market, so they won’t lose customers or readers to the competition. It’s important in helping us maintain customer retention and therefore goes to the very heart of our business,” adds Mr Caldwell. 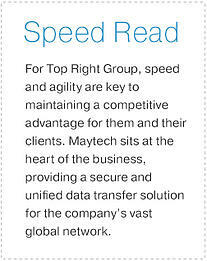 Harness the first mover advantage in your industry from fast, global data transfers with Maytech’s secure solutions. Speak to our team today to find out more.